Meghan Markle suffered a major fashion faux pas, as she arrived in Tonga with Prince Harry on Thursday morning. 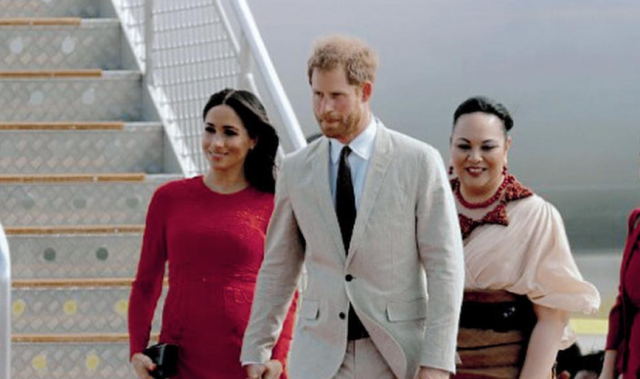 The couple, who are expecting their first child in the spring, jetted into Fua’amotu Airport this morning, where they were greeted by Princess Angelika Latufuipeka. 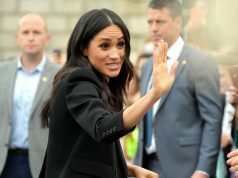 Unfortunately for Meghan, the tag was still attached to the bottom of her Self-Portrait dress as she stepped off the plane – and it made an appearance in practically all of the photos that were snapped of the pair. After touching down in Tonga, locals in traditional garb greeted them with a musical performance. 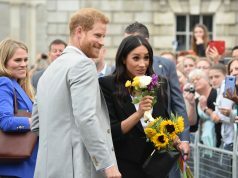 The Duke and Duchess of Sussex are expected to attend a reception dinner featuring traditional entertainment at Consular House later today. On Friday, the couple will attend a cultural exhibit, travel to a school with an onsite forest, and meet with local traders and visit Tupou College. 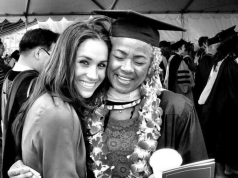 After spending a few days in Tonga, the Royal pair will return to Sydney, Australia, for the closing ceremony of the Invictus Games, before wrapping up their tour in New Zealand.